This biographical sketch is from Elder Porphyrios: Testimonies and Experiences, by Klitos Ioannidis. In 2013, after this was written, Elder Porphyrios was glorified as a Saint of the Church. His commemoration is on December 2. A number of books on the Elder's life and teaching are in print; especially recommended is Wounded by Love: The Life and Wisdom of Elder Porphyrios, edited by the Sisters of the Holy Convent of Chrysopis. Elder Porphyrios was born on the 7th of February 1906, in the village of St. John Karystia, near Aliveri, in the province of Evia. His parents were poor but pious farmers. His father's name was Leonidas Bairaktaris and his mother's was Eleni, the daughter of Antonios Lambrou. The Elder attended the school in his village for only two years. The teacher was sick most of the time and the children didn’t learn much. Seeing the way things were, Evangelos left school, worked on the family farm and tended the few animals that they owned. He started working from the age of eight. Even though he was still very young, in order to make more money, he went to work in a coal mine. He later worked in a grocer's store in Halkhida and in Piraeus. He also immersed himself in the prayers, services and hymns of the Church, learning them by heart while working with his hands. Eventually from the continual repetition of the Gospel and from learning it by heart the same way, he was unable to have thoughts that were not good or that were idle. He characterized himself, in those years, as being "forever on the move." It was still dawn, and the main church of Kavsokalyvia was locked. Nikitas, however, was standing in the corner of the church entrance waiting for the bells to ring and the doors to be opened. Divine grace spilled over from holy Fr. Dimas and cascaded down upon the young monk Nikitas who was then ready to receive it. His feelings were indescribable. On his way back to the hut, after receiving Holy Communion in the Divine Liturgy that morning, his feelings were so intense that he stopped, stretched out his hands and shouted loudly "Glory to You, O God! Glory to You, O God! Glory to You, O God!" The first sign of these gifts was when his elders were returning from a far-away journey, he was able to "see" them at a great distance. He "saw" them there, where they were, even though they were not within human sight. He confessed this to Fr. Panteleimon who advised him to be very cautious about his gift and to tell no-one. Advice which he followed very carefully until he was told to do otherwise. His sensitivity to things around him soon became very acute and his human capacities developed to their fullest. He listened to and recognized bird and animal voices to the extent that he knew not just where they came from, but what they were saying. His sense of smell was developed to such a degree that he could recognize fragrances at a great distance. He knew the different types of aroma and their makeup. After humble prayer he was able to "see" the depths of the earth and the far reaches of space. He could see through water and through rock formations. He could see petroleum deposits, radioactivity, ancient and buried monuments, hidden graves, crevices in the depths of the earth, subterranean springs, lost icons, scenes of events that had taken place centuries before, prayers that had been lifted up in the past, good and evil spirits, the human soul itself, just about everything. He tasted the quality of water in the depths of the earth. He would question the rocks and they would tell him about the spiritual struggles of ascetics who went before him. He looked at people and was able to heal. He touched people and he made them well. He prayed and his prayer became reality. However, he never knowingly tried to use these gifts from God to benefit himself. He never asked for his own ailments to be healed. He never tried to get personal gain from the knowledge extended to him by divine grace. Every time he used his gift of discernment, (diakrisis) the hidden thoughts of the human mind were revealed to him. He was able, through the grace of God, to see the past, the present and the future all at the same time. He confirmed that God is all-knowing and all-powerful. He was able to observe and touch all creation, from the edges of the Universe to the depth of the human soul and history. St. Paul’s phrase "One and the same Spirit works all these things, distributing to each one individually as He wills" (1.Cor.12:11) certainly held true for Elder Porphyrios. Naturally, he was a human being, and received divine grace, which comes from God. This God who for reasons of His own sometimes did not reveal everything. Life lived in grace is an unknown mystery for us. Any more talk on the matter would be a rude invasion into matters we don’t understand. The Elder always pointed this out to all those who attributed his abilities to something other than grace. He underlined this fact, again and again, saying "It’s not something that’s learnt. It’s not a skill. It is GRACE." After this the resident Metropolitan of Karystia, Panteleimon appointed him with an official letter of warrant to be a father confessor. He carried out this new "talent" that was given him with humanity and hard work. He studied the "Confessor’s Handbook." However, when he tried to follow to the letter what it said regarding penance, he was troubled. He realized that he had to handle each of the faithful individually. He found the answer in the writings of St. Basil, who advised, "We write all these things so that you can taste the fruits of repentance. We do not consider the time it takes, but we take note of the manner of repentance." (Ep.217no.84.) He took this advice to heart and put it into practice. Even in his ripe old age he reminded young father confessors of this advice. 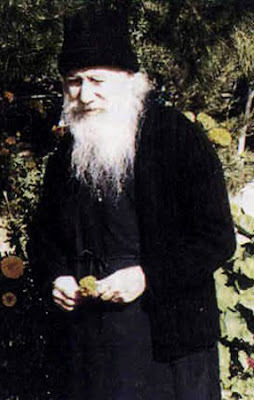 Having matured in this way the young hieromonk Porphyrios, by God’s grace, applied himself successfully to the work of spiritual father in Evia until 1940. He would receive large numbers of the faithful for confession every day. On many occasions he would hear confession for hours without a break. His reputation as a spiritual father, knower of souls, and sure guide, quickly spread throughout the neighboring area. This meant that many people flocked to his confessional at the Holy Monastery of Lefkon close to Avlona, Evia. Sometimes whole days and nights would pass by with no let-up and no rest, as he fulfilled this godly work, this sacrament. He would help those who came to him with his gift of discernment, guiding them to self-knowledge, truthful confession and the life in Christ. With this same gift he uncovered snares of the devil, saving souls from his evil traps and devices. 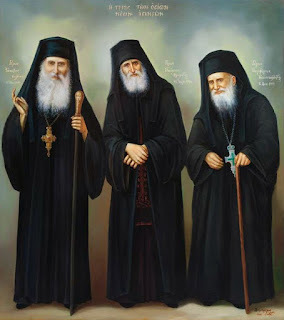 In 1938 he was awarded the office of Archimandrite from the Metropolitan of Karystia, "in honor of the service that you have given to the Church as a Spiritual Father until now, and for the virtuous hopes our Holy Church cherishes for you" (protocol no. 92/10-2-1938) as written by the Metropolitan. The hopes of whom, by the grace of God, were realized. Priest, for a short time at the parish of Tsakayi, Evia and to the Monastery of St. Nicholas of Ano Vathia. He was assigned by the resident Metropolitan as a priest to the village of Tsakayi, Evia. Some of the older villagers cherish fond memories of his presence there to this day. He had left the Holy Monastery of St. Charalambos because it had been turned into a convent. So, around 1938 we find him living in the ruined and abandoned Holy Monastery of St. Nicholas, Ano Vathias, Evia, in the jurisdiction of the Metropolitan of Halkhida. There were other applicants with excellent credentials who were also interested in the post, but the Lord enlightened the director of the Polyclinic. Humble and charming, Porphyrios, who was uneducated according to the standards of the world but wise according to God, was chosen. The person who made this choice later expressed his amazement and joy in finding a true priest saying, "I found a perfect father, just like Christ wants." "Yes, you yourselves know that these hands were provided for my necessities and for those who were with me" (Acts 20:34). Elder Porphyrios, with his lack of academic qualifications, agreed to be chaplain of the Polyclinic for a salary of next to nothing. It was not enough to support himself, his parents and the few other close relatives who relied on him. He had to work for a living. He organized in succession, a poultry farm and then a weaving-shop. In his zeal for services to be celebrated in the most uplifting manner, he applied himself to the composition of aromatic substances which could then be used in the preparation of the incense used in divine worship. In fact in the 1970’s he made an original discovery. He combined charcoal with aromatic essences, now censing the church with his own slow-burning charcoal that gave off a sweet fragrance of spirituality. He never, it seems, revealed the details of this discovery. He valued work highly and would allow himself no rest. He learnt from experience the words of abba Isaac the Syrian, "God and his angels find joy in necessity; the devil and his workers find joy in idleness." Towards the end of his service at the Polyclinic he became ill with kidney trouble. However, he was operated on only when his sickness was in its advanced stages. This was because he worked tirelessly despite his illness. He had become used to being obedient "unto death." He was obedient even to the director of the Polyclinic, who told him to put off the operation, so that he could celebrate the services for Holy Week. This delay resulted in him slipping into a coma. The doctors told his relatives to prepare for his funeral. However, by divine will, and despite all medical expectations, the Elder returned to earthly life to continue his service to the members of the Church. On the 20th August 1978, while at St. Nicholas, Kallisia, he had a heart attack (myocardial stroke). He was rushed to the "Hygeia" hospital, where he remained for twenty days. When he left the infirmary he continued his convalescence in Athens in the homes of some of his spiritual children. This was for three reasons. Firstly, he couldn’t go to St. Nicholas, Kallisia, as there was no road and he would have to walk a long way on foot. Furthermore, his house in Turkovounia did not even have the most basic comforts. Finally, he had to be near to doctors. From that time on, his physical health was terribly compromised. However, he continued, his ministry as a spiritual father as much as he could, all the time confessing for shorter periods and often suffering from various other health problems and in the most frightful pain. Indeed, he steadily lost his sight until in 1987 he became completely blind. He steadily decreased the words of advice he gave to people, and increased the prayers he said to God for them. He silently prayed with great love and humility for all those who sought his prayer and help from God. With spiritual joy he saw divine grace acting upon them. Thus, Elder Porphyrios became a clear example of St. Paul the Apostle words, "My strength is made perfect in weakness." Elder Porphyrios did not do anything without the blessing of the Church. Thus, in this instance he sought and received the canonical approval both of His Eminence the Archbishop of Athens and of the Holy Synod. Although the relevant procedures had started in 1978, it was only in 1981, after overcoming much procedural bureaucracy and other difficulties, that he was privileged enough to see the "Holy Convent of the Transfiguration of the Savior" recognized by a Presidential decree and published in the governmental gazette. This is why he also called his Convent the "Transfiguration" and why he wanted the church to be dedicated to the Transfiguration. Finally, through his prayers, he influenced his fellow workers in this venture and succeeded in his aim. After much consultation and hard work on the part of the Elder, a simple, pleasing and perfect design was arrived at. The laying of the foundations took place at midnight between the 25th and the 26th February, 1990 during an all night vigil in honor of St. Porphyrios, Bishop of Gaza, the Wonderworker. Elder Porphyrios, sick and unable to climb the eleven meters down to the ground where the cornerstone was to be laid, with great emotion, offered his cross for the cornerstone. From his bed he prayed, using these words: "O Cross of Christ, make firm this house. O Cross of Christ, save us by Your strength. 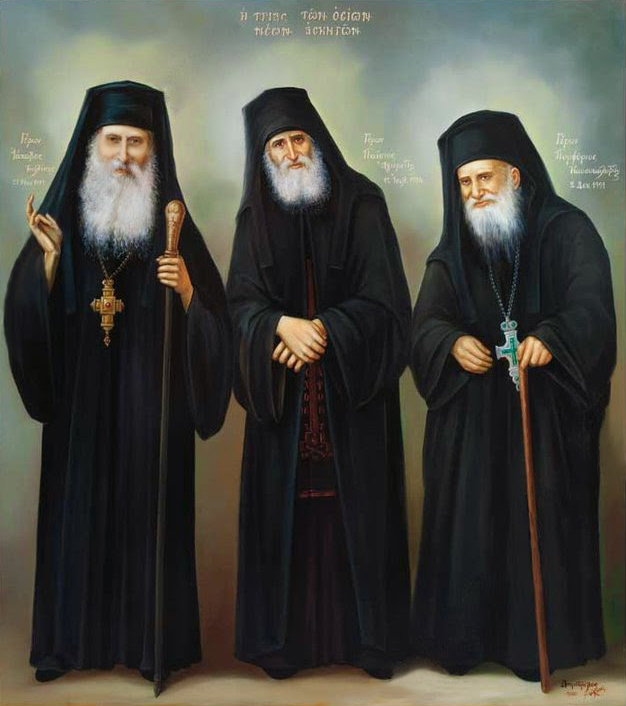 Remember, O Lord, Your humble servant Porphyrios and his companions..." Having prayed for all those who worked with him, he directed that their names to be placed in a special position in the church, for their eternal commemoration. The work of building the Church (out of re-enforced concrete) began immediately. Accompanied by the Elder’s prayers, it progressed without interruption. He was able to see with his spiritual eyes - for he had lost his natural sight many years before -, the church reaching the final stages of that phase of its construction. That is to say, at the base of the central dome. It actually reached this point on the day of the Elder’s final departure. A certain elder, who had prepared his grave when he felt his end was near, said to his disciple, "My son, the rocks are slippery and steep and you will endanger your life if you alone take me to my grave. Come, let us go now that I am alive." And surely his disciple took him by the hand and the elder lay down in the grave and gave up his soul in peace. "Through my coming to you again"
His spiritual children in Athens were constantly calling upon him and he was twice forced to return to the Convent against his will. Here, he gave consolation to all those who needed it. On each occasion he stayed only for a few days, "that our rejoicing for him would be more abundant in Jesus Christ by his coming to us." (Paraphrasing the words of the Apostle, Phil. 1:26.) He would then hurry back to Mt. Athos as quickly as possible. He ardently desired to die there and to be quietly buried in the midst of prayer and repentance. Towards the end of his physical life he became uneasy over the possibility of his spiritual children’s love affecting his wish to die alone. He was used to being obedient and submitting to others. Therefore he told one of his monks. "If I tell you to take me back to Athens, prevent me, it will be from temptation." Indeed, many friends of his had made different plans to bring him back to Athens, since winter was approaching and his health was getting worse. God, who is all-good, and who fulfills the desires of those who feared him, fulfilled Elder Porphyrios’ wish. He made him worthy of having a blessed end in extreme humbleness and obscurity. He was surrounded only by his disciples on Mt. Athos who prayed with him. On the last night of his earthly life he went to confession and prayed noetically. His disciples read the Fiftieth and other psalms and the service for the dying. They said the short prayer, "Lord Jesus Christ, have mercy upon me," until they had completed the rule of a great schema monk. With great love his disciples offered him what he needed, a little bodily and lot of spiritual comfort. For a long time they could hear his holy lips whispering the last words that came from his venerable mouth. These were the same words Christ prayed on the eve of his crucifixion "that we may be one." 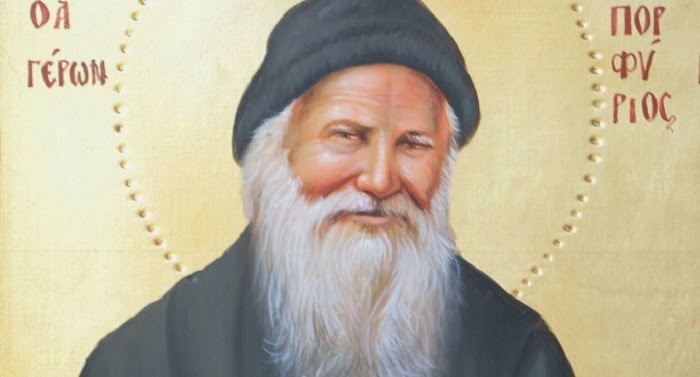 Elder Porphyrios throughout his whole life received all those who came to him; becoming, like St. Paul, "All things to all people in order to save them." His spirit generally speaking was one of absolute submission to the "official" Church. He did absolutely nothing without her approval. He knew from experience in the Holy Spirit that the bishops are bearers of divine grace quite independent of their personal virtue. He perceptibly felt divine grace and he saw where it was acting and where it wasn’t acting. He graphically emphasized that grace is opposed to the proud, but not to sinners, however humble. The Elder taught that the basic element of the Spiritual life in Christ, the great mystery of our faith, is unity in Christ. It is that sense of identifying with our brother, of carrying the burdens of one another, of living for others as we live for ourselves, of saying "Lord Jesus Christ have mercy upon ME" and for that "ME" to contain and to become for ourselves the pain and the problems of the other, of suffering like they suffer, of rejoicing like they rejoice, their fall becoming our fall and their getting up again becoming our getting up again. This is why his last words, his last entreaty to God, his last prayer, his greatest desire was that we "become one." That was what he ached, wished and longed for. The Elder knew that because it’s our weakest point, it is here that the evil one does greatest battle. We put our own interests first. We separate ourselves. We want to flee the consequences of our actions for ourselves only. However when such a spirit prevails, there is no salvation for us. We must want to be saved along with everyone else. We should, together with God’s saint, say, "If you don’t save all of these people, Lord, then erase my name from the book of Life." Or, like Christ’s apostle, wish to become accursed from Christ, for the sake of my fellow man, my brothers and my sisters.